Stefan Tanaka examines how late nineteenth and early twentieth century Japanese historians created the equivalent of an "Orient" for their new nation state. He argues that the Japanese attempted to use a variety of pasts—Chinese, Indian, and proto-historic Japanese—to construct an identity that was both modern and Asian. 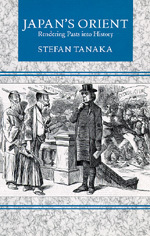 Stefan Tanaka is Associate Professor of History, University of California, San Diego.